This will teach you how to validate and activate your routes. Once a route has been entered in to the Route box it will automatically be validated against the on device data before it can be activated for plotting on the Enroute map. The validation will look for any syntactical errors in the route string and issue warnings. The route string is made up of individual elements. Each individual element is validated and is colored White, Green, Red or Orange depending on the validation. RED: However, if an element has been identified as red after the validation has been completed, then this element has been found to have an error regarding the syntax or couldn’t be identified in the internal database. You will be able to view the description for this error by double-tapping on the error and moving the cursor to the error. WHITE: Elements that are White are yet to be validated. They will remain White until the validation process has been completed. Items that remain permanently White after the route validation process has finished are elements that are excluded from the route validation, i.e. 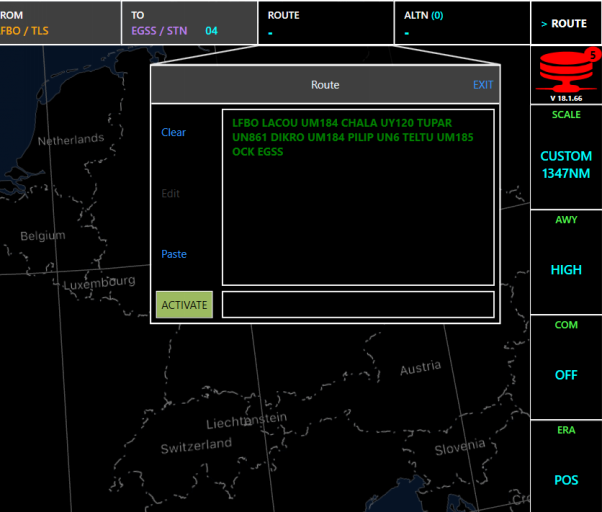 speed and altitude information, ETD or ETA. ORANGE: The validation identified 2 elements as a warning for this route. SID and STAR information are listed in orange, they are currently not used to pre-populate the chart screen nor depicted in the enroute map. GREEN: Once the validation has been completed and the element is successfully validated against the internal database and required syntax, the element is identified in green. Let's have a go at validating a route. We shall start by either loading a route up or creating a new one. Click the Route menu button. 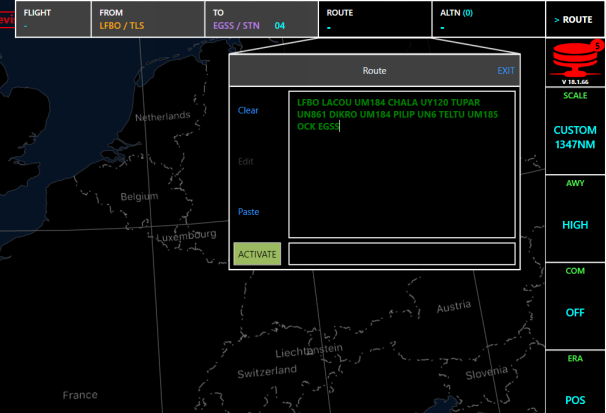 In this example we have loaded a route already in the system. 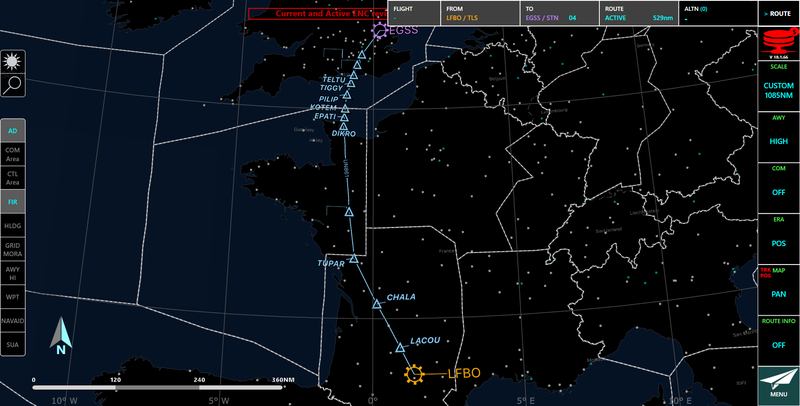 This route is from LFBO Toulouse to EGSS Stanstead. You now need to activate the route. Click the Route active menu item. You can see that the route is all green, which means that the route segments have been successfully validated and the activate button is highlighted allowing you to activate this route. Before we activate the route we shall have a look at the route which may contain errors. You can see that part of the route has turned red with a note in the box saying unknown value. We have removed the S from EGSS which is showing the error, let's put it back. Enter S onto the end of EGS. The activate is still highlighted. A route with elements that failed validation can still be activated for route plotting. 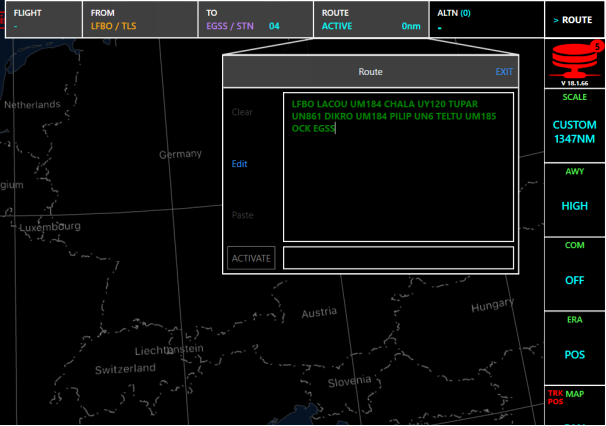 Those elements that failed validation will not be considered in the route plotted in the Enroute map. Instead, a dashed line will be drawn between the last valid element and the next valid element. The route has gone green again and is now validated. 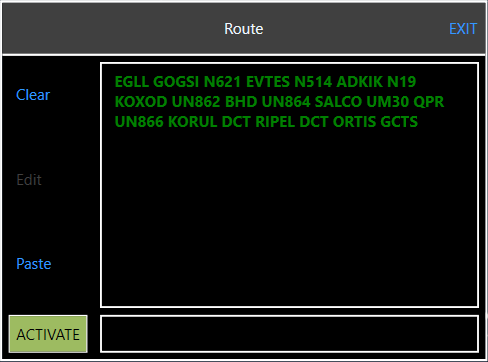 You can now activate the route which will now plot the route on the enroute map. The route will now be visible on your Enroute screen as a blue line indicated with all the Waypoints/Navaids and Airways along the route. Information related on the route depicted on the enroute map depends on the zoom scale. Higher zooms will produce more information. Route plotted with all elements validated. Error in spelling of DIKRO (entered as “DIKBO”) shows the DCT from PILIP to TELTU as invalid. A dashed line has been plotted connecting the last valid element. Route plotted with all the elements validated. Route has now a solid line. 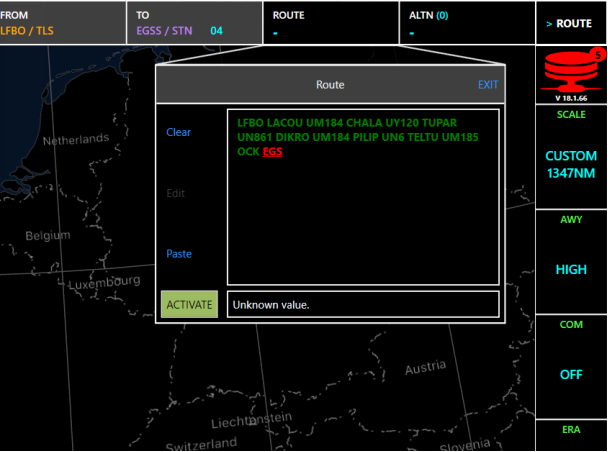 Once a route has been inputted into the route toolbar the route will be visible in the Enroute screen. 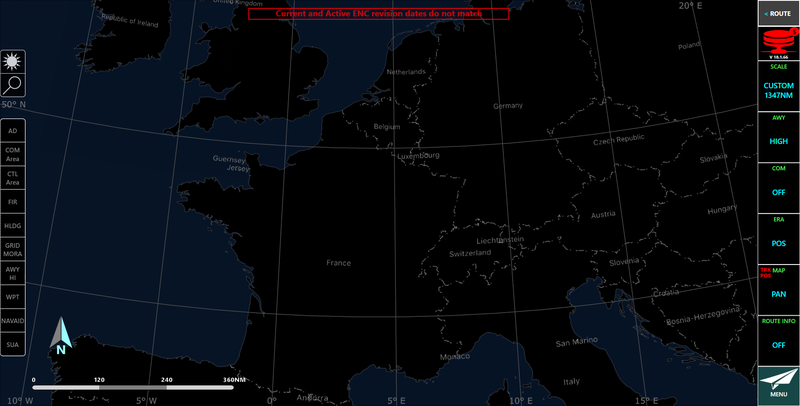 The aerodromes that have been selected will be visible and much larger with the following colors. 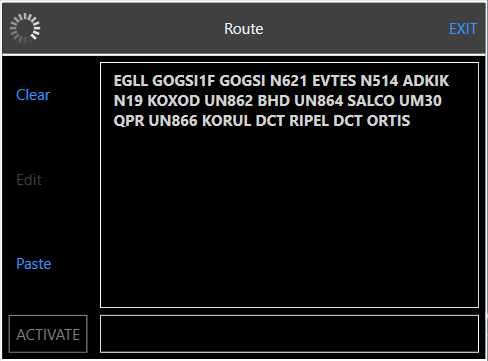 Route segments that are direct to a Waypoint/Navaids are depicted with a dashed line and route segments that follow an airway that has been validated will appear as solid lines. 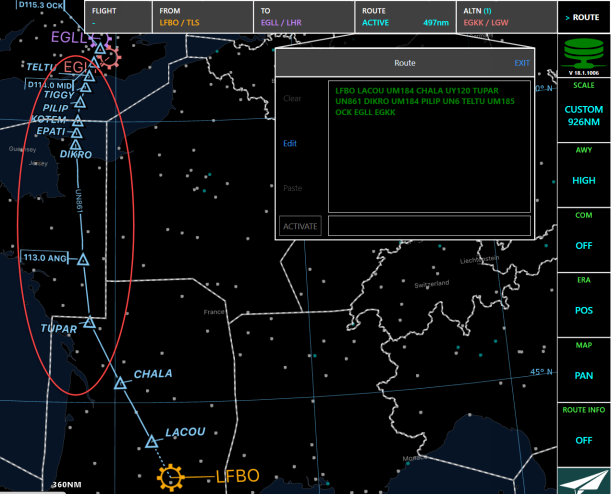 Airways, Waypoints and Navaids will be identified in a blue color. 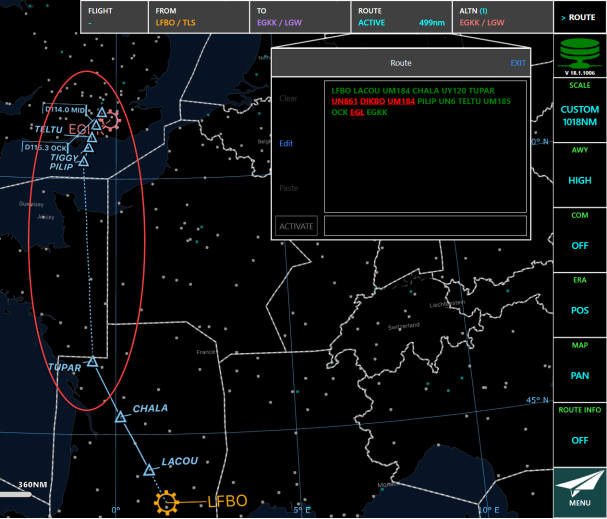 Navaids and Waypoints along with the route information will increase in size and be visible at higher zoom levels.